You have added Twinkling Trim Embellished Maxi Dress in Blue into shopping cart. This embellished maxi dress is absolutely stunning. It has a grecian goddess feel we love. The Twinkling Trim Embellished Maxi Dress is fully lined to the mid-thigh. It is made entirely of chiffon. The bust has a crossover sweetheart neckline made of pleated chiffon and a lightly padded bust. The waistband and shoulder straps of this dress are decorated with beads that form an intricate pattern. The attached skirt has a full length maxi cut and is made of semi-sheer chiffon. This beautiful dress would be perfect for your next formal event or dance. Pair it with strappy heels, a clutch, and some delicate jewelry and you'll get noticed anywhere you go. Details: Lined to mid-thigh. Lightly padded bust. 100% polyester. Lining: 100% polyester. Hand wash cold water separately. Color will bleed. No bleach. Hang to dry. Small measurements: Length from top of shoulder to hemline: 58". Bust: 32". You have added Twinkling Trim Embellished Maxi Dress in Blue into Wishlist. 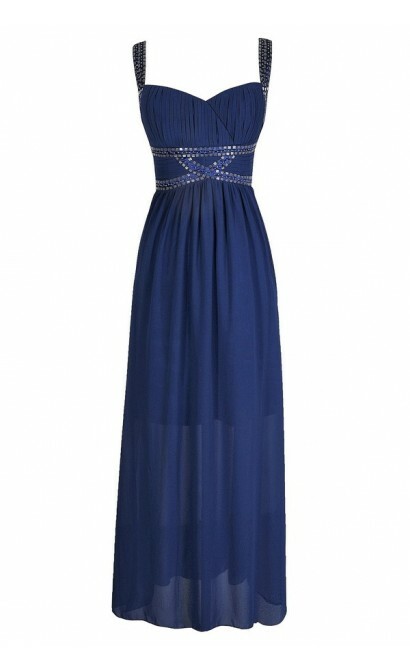 You have added Twinkling Trim Embellished Maxi Dress in Blue for Stock Notification. 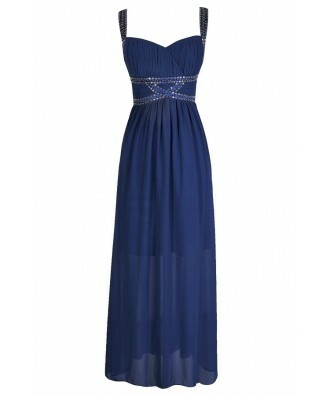 You have set Twinkling Trim Embellished Maxi Dress in Blue as a loved product. You have removed Twinkling Trim Embellished Maxi Dress in Blue as a loved product.